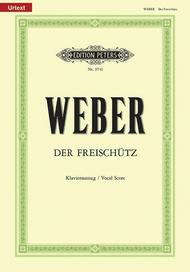 Der Freischutz (Piano/Vocal Score) composed by Carl Maria von Weber (1786-1826) and Carl Maria von Weber (1786-1826). For 2 soprano voices, 2 tenor voices, baritone voice, 3 bass voices, speaker, SATB chorus, piano. Opera. Vocal score. Text Language: German. Published by Edition Peters (PE.P09741).With Text Language: German. Opera.Piano/Vocal Score (German) Full Score (EP9740) is also available for purchase Cloth-Bound Study Score (EP1000A) is also available for purchase Performance Material is available on a rental basis.